Dallas, TX (Updated July 9, 2012) — Ro2 Art is proud to present 5 Photographers: Ro2 Art Third Annual Photography Show – new work by Chris Bramel, Sibylle Bauer, Tuba Koymen, Alisa Levy, and Byrd Williams IV. The opening reception will take place Saturday, July 14, 2012, with the exhibition running through September 1, 2012. place at Ro2 Art's Downtown Elm Street Gallery, located at 1408 Elm in Dallas, Texas. Chris Bramel is a recent graduate of Texas Christian University, in Fort Worth, Texas, where he recently earned his Bachelors of Fine Arts, with a concentration in photography. At just 23 years old, Chris has recently completed a 10,000 mile trek across the the Western United States, visiting twelve states, eleven national parks, and driving "more backwoods highways than you could shake a stick at," all in an effort to find new perspectives as an artist. Through this journey, the artist arrived home with thousands of images that would be intertwined and formatted into six-sided, 360 degree panoramic photographs. 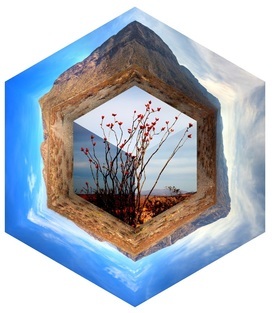 The hexagon, an object of fascination for the artist, has become a vessel for him to surround a central subject image with the entire landscape at it was presented during the artists initial encounter. Sibylle Bauer is the embodiment of a multi-cultural artist. She was born in Mexico City to German parents intent on providing her and her sister a true understanding of their adoptive culture. This translated into constant travel within Mexico, of course in a German Volkswagen Beetle. Additionally, frequent visits to Europe and to the US exposed her to the colors of diverse geographies. Her formal undergraduate and graduate studies took place in Munich and Berlin. Upon returning to Mexico, her re-encounter with the vibrancy of Mexican flora marked her artistic path, as it still does today. Tuba Koymen received her BFA in Graphic Design from Bilkent University in Turkey, going on to earn her MFA in Photography and Digital Imaging from the Maryland Institute College of Art in 1999. The artist considers herself to be an experimental photographer, whose work revolves around geographical, cultural, and emotional issues, with the objective of bringing attention to human nature by setting up an imaginary window. As an artist, Koymen connects with her audience through the use of old-world photography techniques including pinhole photography. She has had major solo exhibitions at Duke University, Light Factory in North Carolina, Austin College, Fort Worth Community Art Center, and Museum Center in Baku, Azerbaijan. Alisa Levy was born and raised, until the age of 12, in the USSR, before moving to Israel, where she finished school and served in the army. After immigrating to the United States in 2003, Levy has focused on raising her family and living life with camera in hand. For her 5 Photographers, Alisa presents a new series culmination of a gesture, with which she explores the world of dance as the highest form of physical gesture. Byrd Williams IV is a fourth generation photographer and is best known for his urban work in the U.S. and Europe. Byrd Williams has been teaching photography for 26 years and as chair, was instrumental in developing the photography program at Collin College. Williams is a published writer (Legendary Landmarks, Ortsbeschreibungen) and international artist whose work has been shown and collected by the Amon Carter Museum, Museum Fine Arts Houston, Tarrant County Court House, Stadtischen Museum Simeonstift of Trier Germany, Kunstlerhaus Schloss Balmoral of Bad Ems, Germany, and the Banque et Caisse D’ epargne de Letat collection, Luxembourge. For 5 Photographers, Byrd presents The Flop House Project, his collaboration with Elizabeth Mellot, through which the artists present an anthropologically based fiction about the characters that inhabited The Diachas Building of Fort Worth, Texas. All works will be on view July 14 through September 1, 2012. Please join us for the opening reception Saturday, July 14 from 7 to 10pm at Ro2 Art Downtown, located at 1408 Elm Street at Akard. For more information, visit www.Ro2art.com or call Jordan Roth at (214) 803-9575.